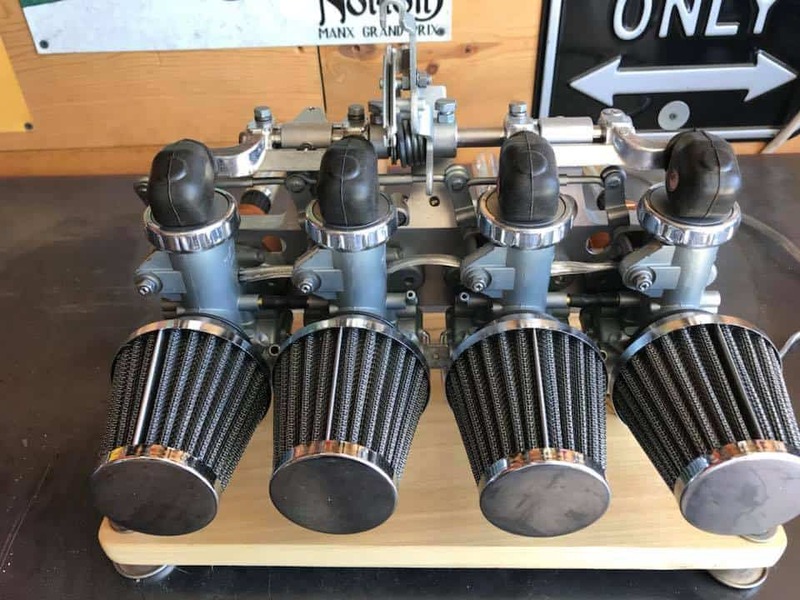 Well, lots of you may know about the bikes and parts I make for these inline Four Motorcycles, I mean- I have been flogging my guts out over them for 18 years here now in Southern California. 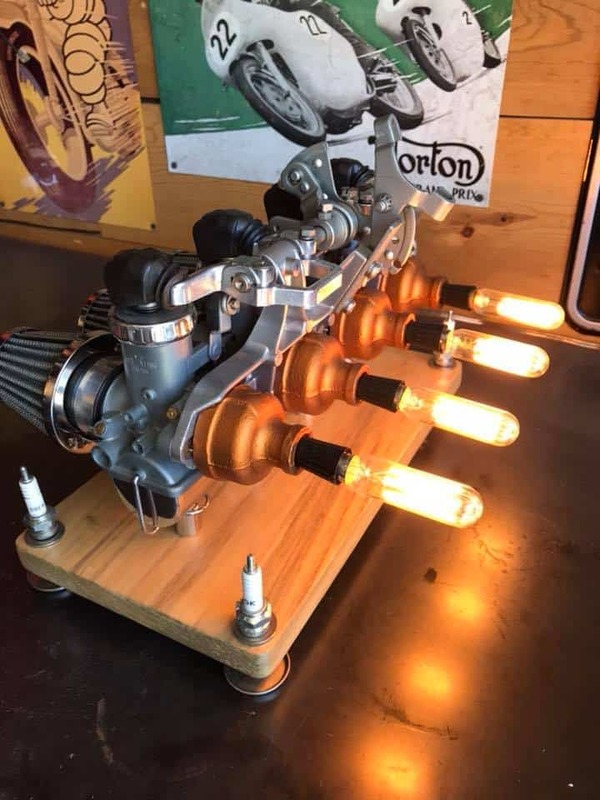 But being a Leo, I enjoy many art and craft things in my life and I have been making Desk lamps for a few years now as a Hobby, I enjoy using broken no usable parts and create unique 110 volt lamps to be used in the Home, Shed, garage or in a shop etc, they make a pretty cool gift too. So many people that have had Motorcycles have always had some broken or non usable parts laying about their Shed, garage or just in a Rubbermaid tub in the back yard, hard to throw away something you paid good money for years ago and even though it is not usable, be it broken, cracked or warped, there is always another life that the particular part can be reused for. 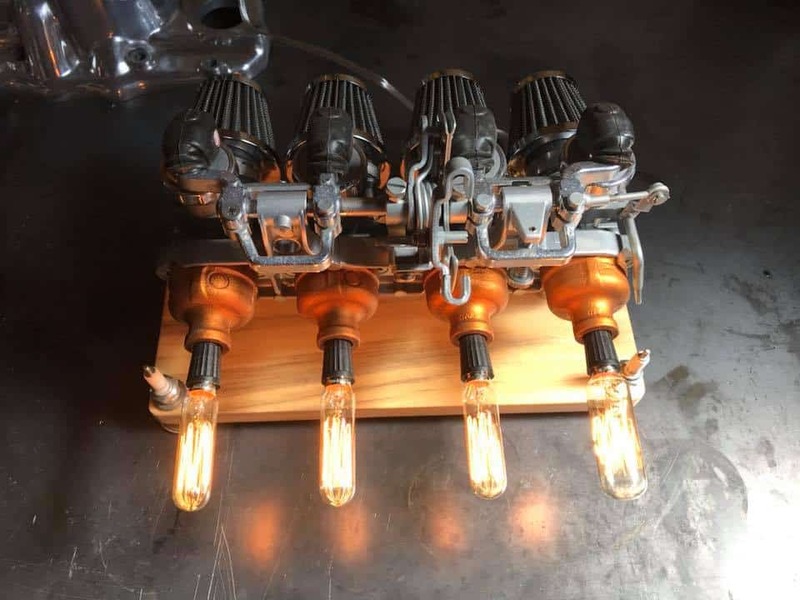 For me, well, I had an old set of broken Carburetors off of a 1974 CB750 Honda, S.O.H.C. model, I would loved to have saved these carbs but the posts inside were broken and the seats where the slide sat. had worn past its use and were no use to anyone on any motorcycle, but, I couldn’t bare to get rid of them and simply toss them away. 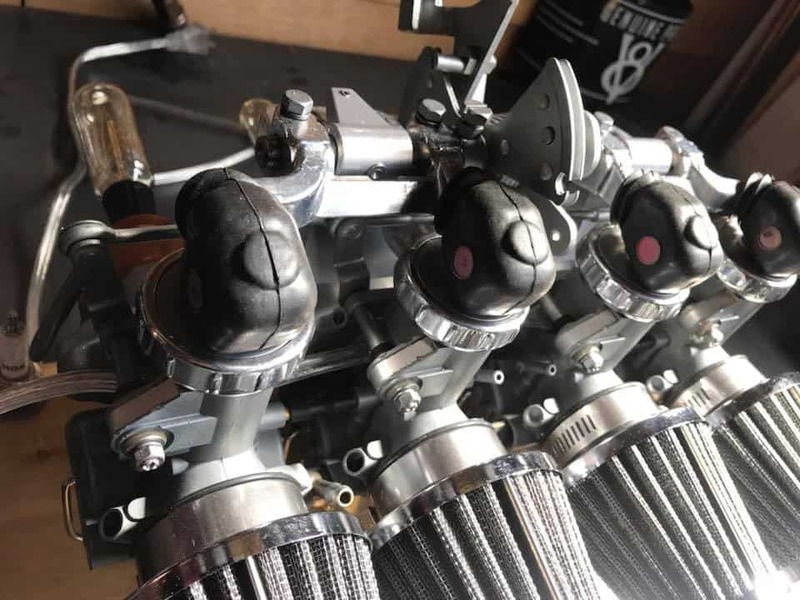 So, what I ventured to do with this rack of carbs was first to thoroughly inspect them to see if these were savable, of which they were not- then I wanted to take these all apart and wash them with S-100 to get oil deposits off, then put in the vapor Blasting cabinet and clean everything up, as Vapor honing will bring the aluminum back up to how it was when they first arrived into the Honda factory. So, I removed all that I could and Vapor Honed the bodies and made sure everything was clean and ready to get transformed into this unique Desk lamp that I had come up with, I have made a few of these now and seem to be a hit, so continue to create these great Lamps for people as they tend to have them made for their Business, a birthday or at Christmas. 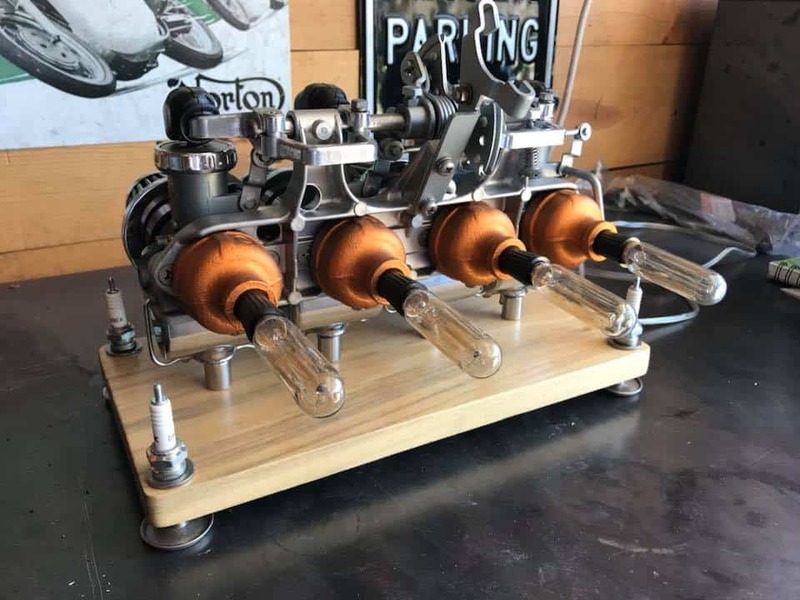 I put this together as carefully as I would if it was going to be used on the motorcycle, took me a little while to get the wiring done and had to drill some holes to allow the cable to run from one Carb body to the next. 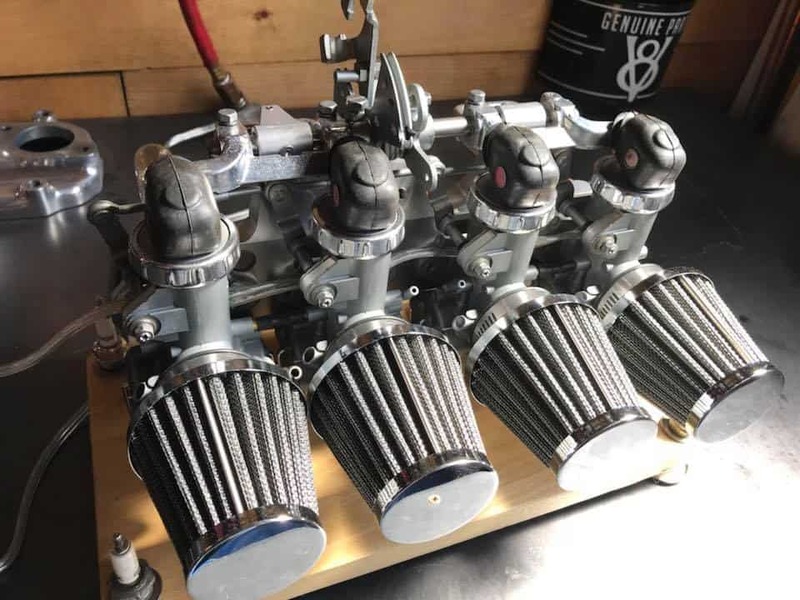 I Polished the float bowls and the Knurled top rings, as I want the carburetor to pop when you see it and also gives the carb rack a nice contrast when its mounted on the wood base that I shall be making. I used Poplar Timber and cut to shape it, rounded the ends and then sanded and stained to give it that old timey look. 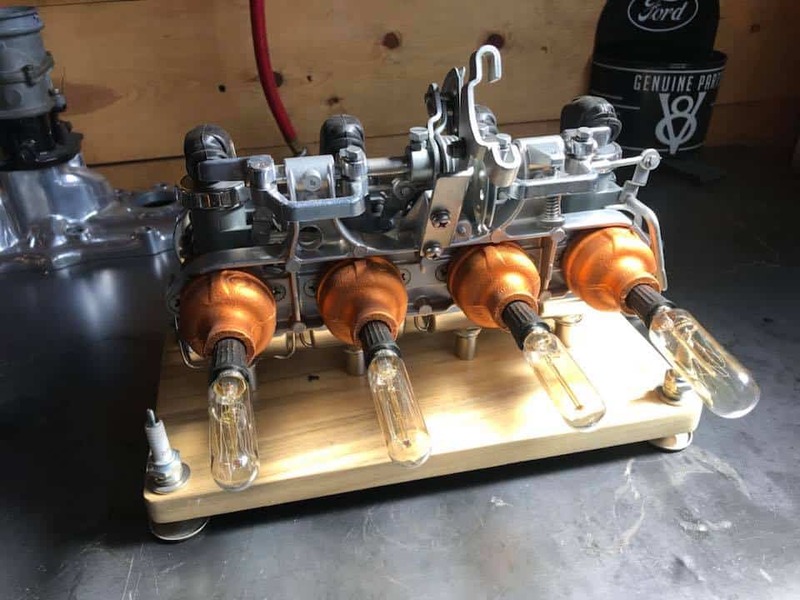 I mounted the carbs using some old Chrome spacers I had in my parts drawers and these seemed to work out just fine for the height of the carbs as I didn’t want them to sit too high up in the air. 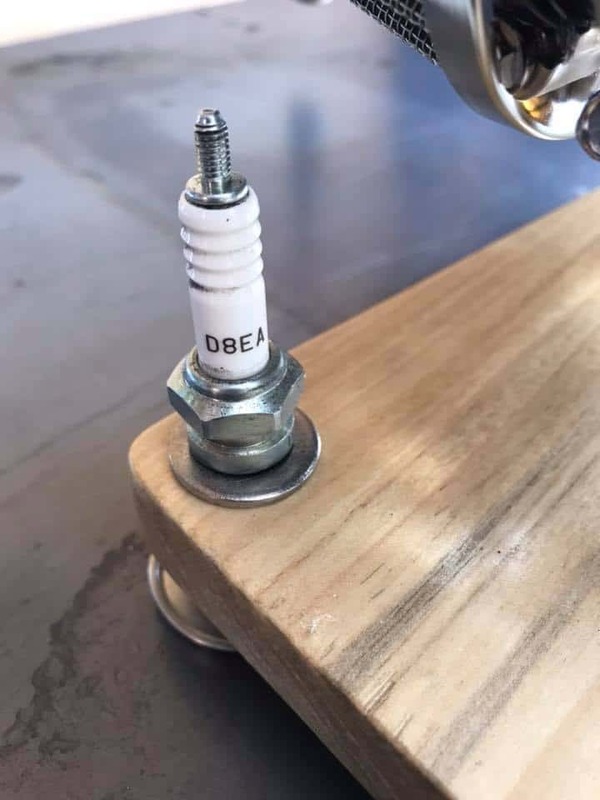 You will also notice that just as an embellishment, I fitted a Spark Plug at each corner of the wooden base, to give some Status Quo, of course, it had to be a set out of a CB750 Honda too. 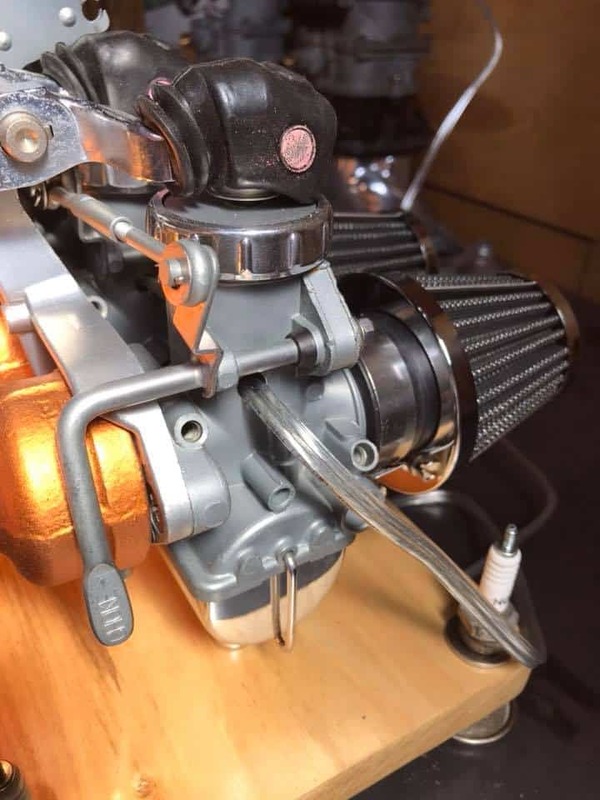 These plugs were pretty sooty and set the base off very well and indeed, as well as a good connection for the carbs as these are Genuine NGK units I have always used on CB750 Honda’s. 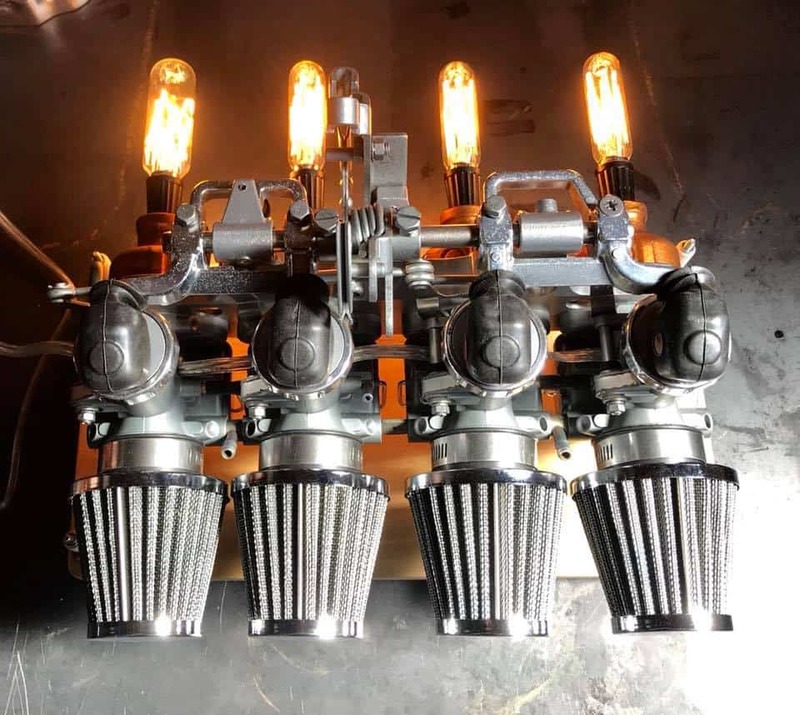 See, they look great lit up and give that warm glow and give to a new life now as something else but this is a real head turner and quite the conversation piece where ever it is located. 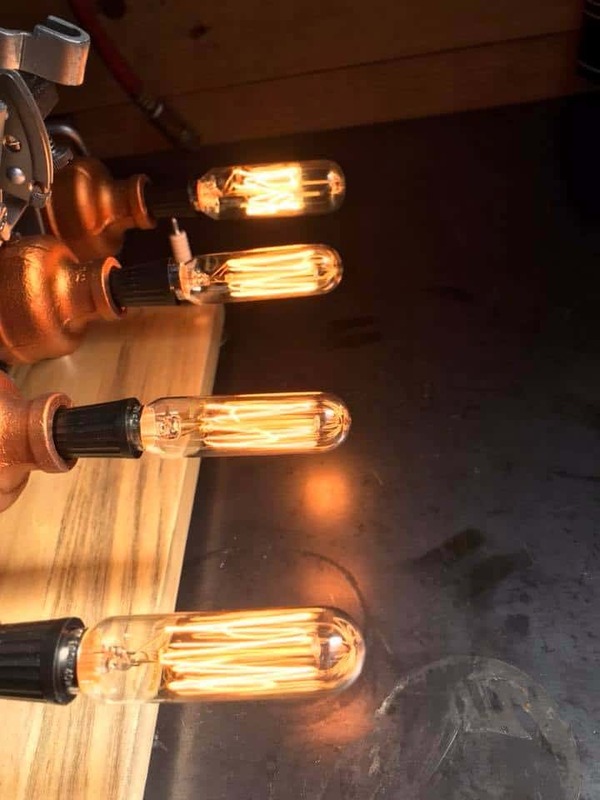 I also wanted to incorporate these Vintage filament bulbs too and these really set the whole piece of and am stoked the way these have turned out in the end. 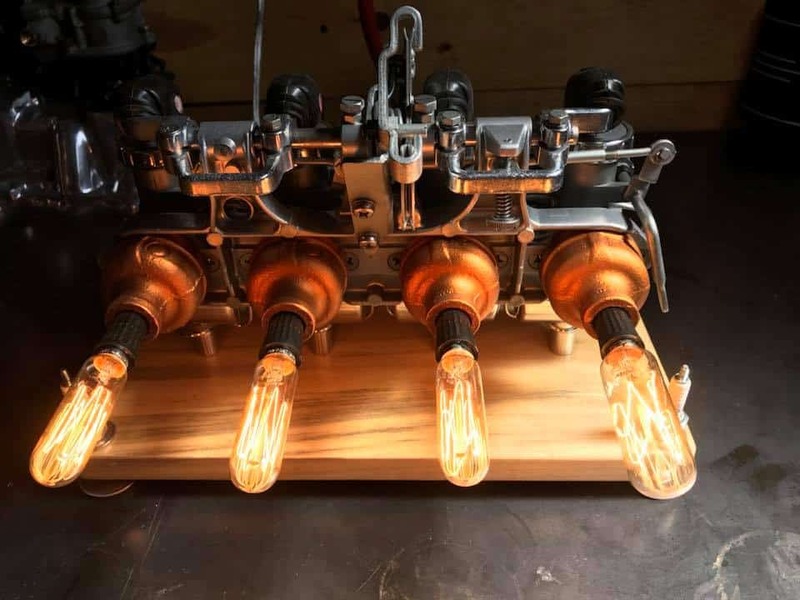 So, let me know if I can help you create a unique lamp out of parts, it takes a little while but its so worth it in the end and of course, always good to recycle stuff right? 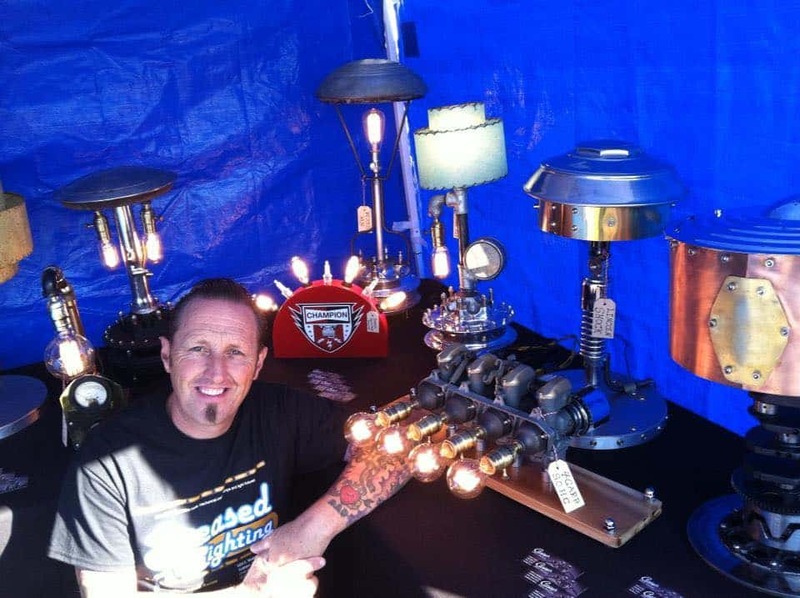 I have made a few different styles of these Lamps for people over the years and enjoy what I do, I throw myself into the design and love the outcome when it is completed. 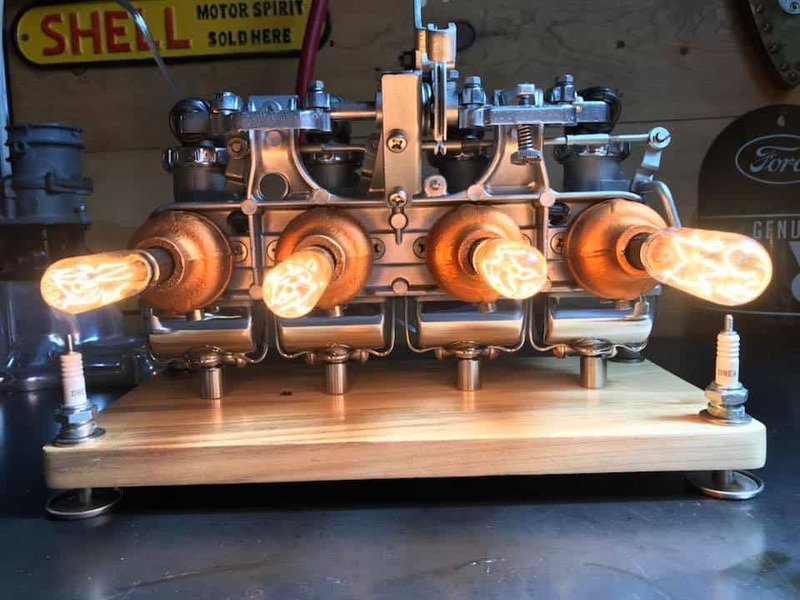 Drop me a line if I can be of help to you at carpy@carpyscaferacers.com or drop a dime at 714-598-8392, you can even text me on that number too for that matter. 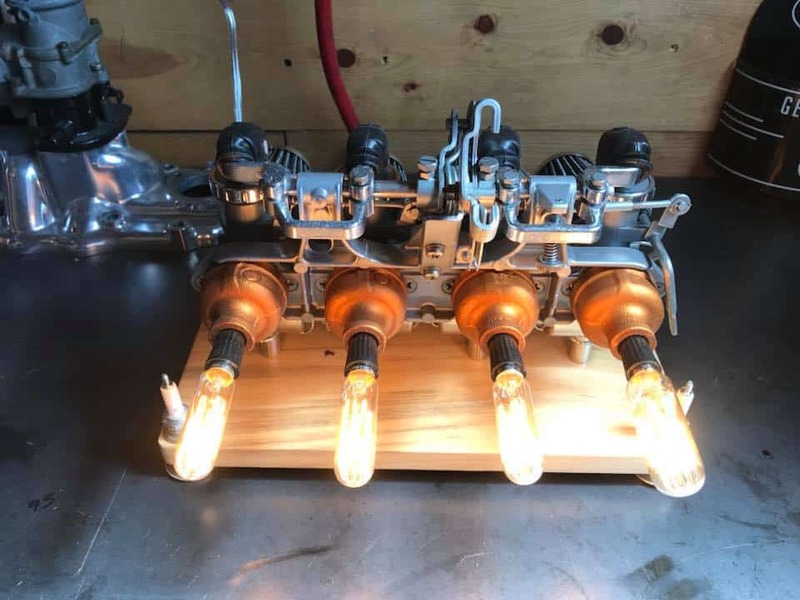 I make these parts starting with small lamps at $150 then go up as per intricacy. 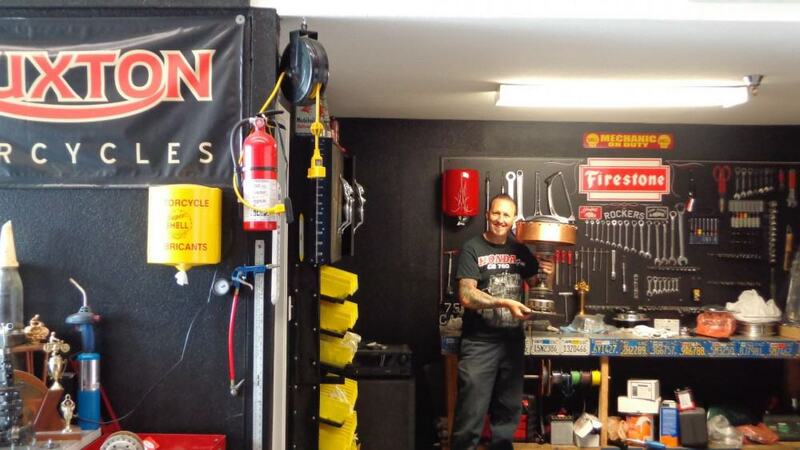 Thanks for looking at my other creations, it makes my career a fun one. 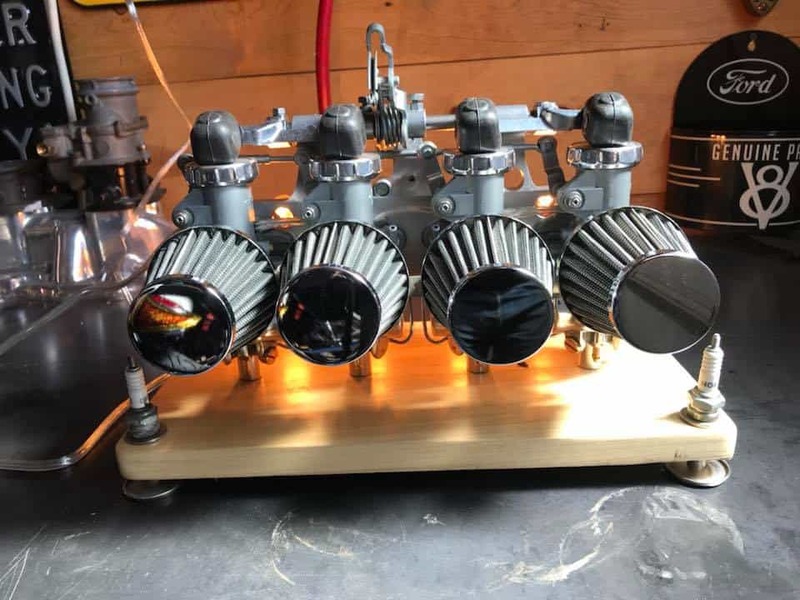 This entry was posted in Blog, General Info and tagged carburetor, carpys lamps, cb750, CB750 Four, cb750f, cb750k, classic motorcycle, desk lamp, Gears n cranks, gift idea, Honda, inline four, lamp, old parts, re use parts, recycle, Seven Fifty, sohc, steam punk, super sport.